At Tilghman Orthodontics, we strive to provide expert orthodontic treatment while maintaining a warm, welcoming office environment. Our doctors have years of experience treating patients in Salisbury, Berlin, Rehoboth Beach and Sussex County, and we work hard to make every visit to our office a pleasant experience. We're proud to offer a wide variety of orthodontic treatment options, and our most popular is braces - but there are more types of braces than you might think! While they aren't the only option available, the most common form of treatment is braces - and for most patients, that means the familiar silver brackets and wires of traditional metal braces. Orthodontic appliances fall into two main categories: fixed appliances (braces) and removable appliances. Fixed appliances, like braces, are usually attached to the teeth with metal bands and a special dental cement. They're generally kept in place for the full duration of treatment, and they won't be taken off until treatment is finished. 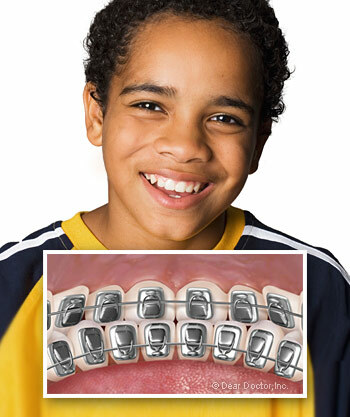 Removable braces, like Invisalign, are completely removable – but they must be worn at least 20-22 hours a day. Dr. Tilghman & Dr. Schwartz always recommend the most effective treatment approach for our patients, which most of the time, is metal braces. Composed of a high-grade stainless steel, traditional metal braces use brackets cemented to the front of teeth and a thin, springy archwire that runs through the brackets. The braces are attached to tooth-colored metal bands that wrap around the rear molars, and the archwire applies force to individual teeth through the brackets. Over time, this force gently guides teeth to new positions. Braces are a time-tested solution that remain the most popular treatment they offer. Modern braces are lighter and more comfortable than those of the past, and they offer one of the most durable, reliable, and cost-effective treatments available. Plus, we can even customize your braces with specially covered elastic ties, helping them express your own unique style! Instead of steel, the brackets are made from a clear, ceramic composite material that blends in with teeth. This makes them far less noticeable and more discreet than traditional braces, making them a favored option for adult professionals and teenagers. While ceramic braces have an undeniable aesthetic appeal, they do come with some trade-offs: they're more delicate than traditional braces, usually a bit more expensive, and while the brackets themselves won't stain between visits, the clear elastic ties that hold the archwire can. 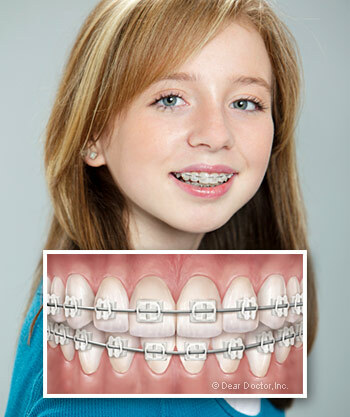 Even with their drawbacks, ceramic braces offer a more discreet option for orthodontic treatment. Clear braces may be inconspicuous, but lingual braces are truly invisible. Why? Because they're mounted to the inside (tongue side) of the teeth! 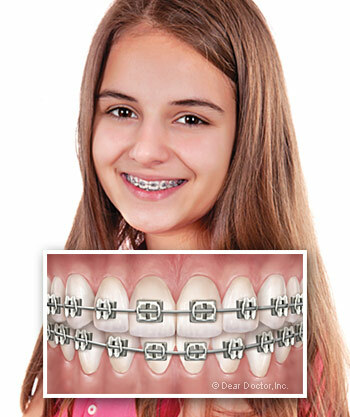 Lingual braces are very similar to traditional braces: they use the same apparatus of brackets and wires and the same stainless steel material. The only difference is that lingual braces are mounted to the back of the teeth instead of the front, making them completely invisible from the outside. This makes them one of the most inconspicuous treatment options available, but they're also more expensive and can take more time to get used to than other options. For a truly invisible option, they can't be beat! If you'd like to find out more about orthodontic treatment or would like to schedule a free consultation, just give us a call at 410-742-4813, or use our easy online form to schedule an appointment. We have two convenient office locations in Salisbury and Berlin, but we also serve many patients from Rehoboth Beach and Sussex County. Dr. Tilghman, Dr. Schwartz, and our entire team is excited to meet you soon!